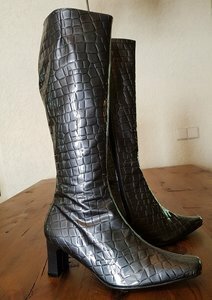 Made from a fashionable top quality patent leather "mock croc" patterning in elegant black. Aspire lives up to it's name - a fabulous mid heel boot with an elegant scissored toe shape that looks equally smart at work or in the evening. A wonderfully soft red pig skin leather lining for the ultimate style and comfort.